Hakusan, Japan, January 18, 2018 – EIZO Corporation (TSE: 6737) today announced the FlexScan S1503-A, a 15-inch square monitor with a 1024 x 768 native resolution. The release of the FlexScan S1503-A ensures EIZO will continue to offer a stable supply of 15-inch monitors for customers that need to retrofit their legacy systems. 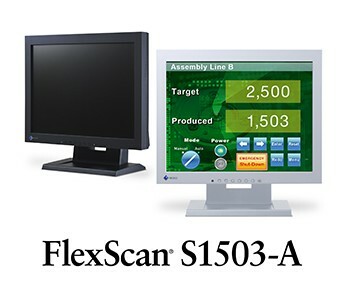 FlexScan S1503-AThe FlexScan S1503-A uses an energy-saving LED backlight and comes with EIZO’s five-year manufacturer’s warranty. It offers excellent visibility with maximum 400 cd/m2 brightness and an ambient brightness sensor that automatically adjusts the screen to the ideal brightness level under any ambient lightning condition. Several preset modes including sRGB, Paper, User1 and User2 (user-defined settings) are included for viewing comfort. A modulated light adjustment function prevents flicker at low brightness settings to reduce eye fatigue. The S1503-A will be shipping in March. The date of availability may vary by country, so please contact the EIZO group company or distributor in your country for details. EIZO (TSE:6737), which means image in Japanese, is a visual technology company that develops and manufactures high-end display solutions. EIZO integrates hardware and software technologies with consulting, web hosting, and other services to help customers in business, graphics, gaming, medicine, maritime, air traffic control, and other fields work more comfortably, efficiently, and creatively. Headquartered in Hakusan, Japan, EIZO has R&D and manufacturing facilities in Japan, China, Germany, and the US, and representation in more than 80 countries. All product names are trademarks or registered trademarks of their respective companies. EIZO and FlexScan are registered trademarks of EIZO Corporation.